Human trials of the Active Knee Rehabilitation Device (AKROD v2), a programmable, portable robotic knee brace, will begin soon at Boston’s Spaulding Rehabilitation Hospital. The device was developed at the Robotics and Mechatronics Laboratory of Northeastern University and was invented by Professor Constantinos Mavroidis and his associates Brian Weinberg and Jason Nikitczuk. It is hoped that the device will significantly help the hundreds of thousands of stroke victims by providing rehab as a part of their daily lives - not just in the hospital setting. "Applying robotics and mechatronics capabilities to a conventional knee brace could significantly improve the gait retraining process for stroke survivors, as they can use it independently while performing everyday activities," says Professor Mavroidis. "The most important challenges we want to meet ultimately are adding real-time adjustment capabilities to the device and making it portable with adequate joint-manipulating capabilities. 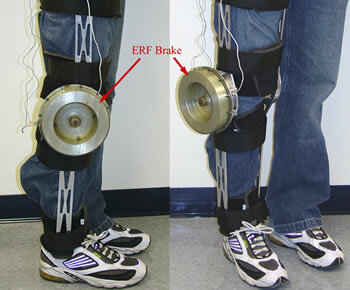 We added the actuators filled with ‘smart fluid’ to the lightweight brace to get closer to accomplishing these goals." A container on one side of the brace is filled with "smart fluid," (electro-rheological fluid); a number of concentric cylinders tightly fit one inside the other leaving only a small gap in between them. When computer-controlled electric voltage is applied to the cylinders, the liquid inside the gap turns solid in less than a millisecond, creating resistance on a healing joint with the turn of a dial. 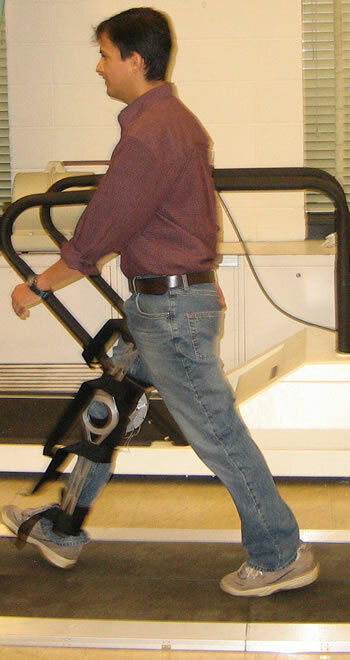 The computer offers real-time modification for gait retraining. This remarkable device is almost an anti-endoskeleton (or anti-powered suit), in that it deliberately provides programmed and calibrateed resistance to specific movements rather than amplifying them, so the human's muscles can regain strength. Fluids that change their properties when a current or magnetic field are being used in many different applications; see Liquid Armor In Two Flavors: Shear Thickening and Magnetorheological for another use. Finally, when asked about science and science fiction, Prof. Mavroidis replied "To tell you the truth I am not a science fiction fan. However, I believe in science fiction as a way to 'think big', to get out of the ordinary so that you get all the new and great ideas that you can use in science. I believe that without science fiction we cannot have big inventions."